Klara Lazarev doesn’t have time for romance. She’s too busy forging her own path in life: scrambling to finish her senior thesis, applying to grad school, writing innovative software in her spare time. Besides, she’s been burned before. She refuses to let it happen again—especially with a man who can’t even recall that they’ve already met. Russian-born venture capitalist Vlad Snezhinsky excels at two things: making money and being a dad. Still struggling to get over a disastrous marriage, he has zero interest in starting a new relationship. That is, until he runs into his colleague’s stunning sister-in-law, Klara. Klara Lazarev doesn't have time for anything but finishing school and her senior thesis. While visiting her sister one night, she sees a man she met a few years ago at Leo and Anna's wedding and didn't think she would see him again. But here in her brother-in-law’s office is Vlad Snezhinsky, a Russian born venture capitalist, and he is eyeing Klara like she is the last supper for a man on death row. Vlad knows that he knows Klara from somewhere but he can't remember where. When she reminds him, he is shocked because he can't remember what happened at the wedding. He was drunk after all, because he learned some shocking news from his wife and drinking was the only way he was able to save face at that time. Now fast forward a few years and he is divorcing his wife, or has been trying for the last year but she keeps asking for more in the divorce settlement. All Vlad wants is his daughter, Lora, and to be left alone for good. But Klara is working her way under his skin and there is nothing he can do about it. After a few dates with Klara, he wants to slow things down because he has a daughter and she comes first. But when a double murder happens, it throws their world into a tailspin. Can Vlad make Klara see that he had nothing to do with the murders? Will Klara show Vlad that she trusts him completely or will that voice in the back of her mind win, you know the one that keeps asking could he really kill someone? I love this series and that each story can be read as a standalone but the characters overlap in each one. This is the last in the trilogy – and although I think you could read it as a standalone, there are characters that interlink and the experience would be richer if you read them in order. They have all been excellent reads. There is a good level of drama, intrigue, and a really lovely love story. The Russian connection and the bigger picture make for an interesting backdrop to a complicated scenario. Klara is a good person who has plenty to question about Vlad, but somehow she deals with it all. And any romance reader will be happy with the outcome! 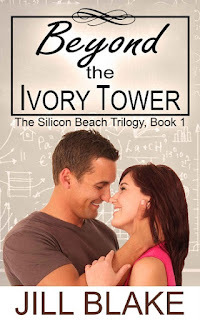 For reviews & more info, check out our Beyond the Ivory Tower post. For reviews & more info, check out our Sweet Indulgence post. Jill Blake loves chocolate, leisurely walks where she doesn’t break a sweat, and books with a guaranteed happy ending. A native of Philadelphia, Jill now lives in southern California with her husband and three children. During the day, she works as a physician in a busy medical practice. At night, she pens steamy romances. 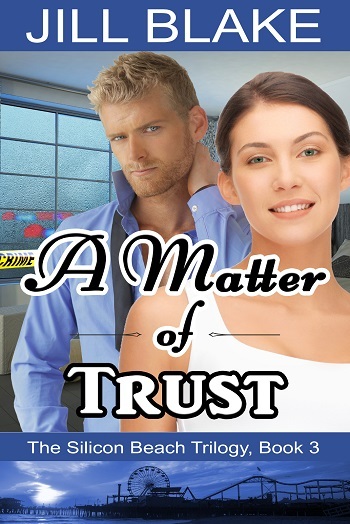 Reviewers on the Wicked Reads Review Team were provided a free copy of A Matter of Trust (The Silicon Beach Trilogy #3) by Jill Blake to read and review.